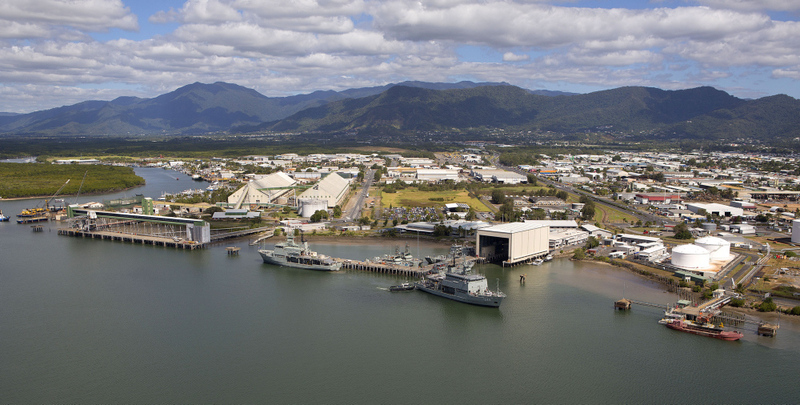 Welcome to HMAS Cairns, located in Draper Street, Portsmith, Cairns, on the northern shore of Trinity Inlet and close to the central business district of Cairns. The base completed a major redevelopment in 2009. With a responsibility extending from Rockhampton to Thursday Island, HMAS Cairns has 900 Navy and civilian personnel and is the homeport for nine Naval Vessels. HMAS Cairns primary responsibility is to provide maintenance, logistic and administrative support for Cairns based units listed below. HMAS Cairns also provides refit and training support for neighbouring Pacific Island nations (Pacific Class Patrol Boats). The Armidale class patrol boat HMAS Wollongong (III) (P92) is based in HMAS Cairns. Armidale Class Patrol Boat HMAS Wollongong (III). Australian Defence Vessel Cape Fourcroy. The Navy has two Hydrographic Survey Ships (HS), four Survey Motor Launches (SML) and the Australian-developed Laser Airborne Depth Sounder (LADS) mounted inside a Dash 8 Aircraft. Hydrographic Systems Operator sailors (HSOs) are employed onboard the Hydrographic Survey Ships, Survey Motor Launches and on the Laser Airborne Depth Sounder Aircraft. All units operate out of Cairns, North Queensland. Shore postings include Cairns; the RAN Hydrographic School at HMAS Penguin, Middle Head in Sydney; and both the Australian Hydrographic Office (AHO) and the Deployable Geospatial Survey Team (DGST) based in Wollongong. Leeuwin Class Hydrographic Survey Ship HMAS Leeuwin. Paluma Class Survey Motor Launch HMAS Paluma. de Havilland Dash 8-200 LADS. The Laser Airborne Depth Sounder (LADS) produces around half the data collected annually by the Hydrographic Service and is particularly suited to coastal and dangerous coral reef areas. The mission of the Fleet Support Unit - North East is to manage the employment of technical and seaman branch sailors ashore such that they proceed to sea fully prepared "to fight and win in the maritime environment". Left: World War II Bathurst Class Corvette HMAS Cairns (AWM AWM045083) Right: HMAS Cairns before redevelopment in 2008-2009. HMAS Cairns was named after an Australian World War II Bathurst Class Corvette of the same name which began its sea service in 1942, serving in the Indian Ocean, Eastern Africa, the Mediterranean and in Australian waters. The Royal Australian Navy has been a regular visitor to the port of Cairns for many decades stretching well back before World War II. Many ships, both military and merchant, made Cairns their principal port of call when travelling up the east coast of Australia during World War II for resupply and refit prior to heading to New Guinea, Java, the Solomon Islands and many other destinations throughout the Pacific. A permanent Navy presence in Cairns did not begin however, until the new Patrol Boat Facility opened up at Grafton Street on 29 January 1971, under the Command of LEUT HP Shaw RAN. Starting with a complement of only one officer and 15 sailors, the facility was to provide general repair and maintenance facilities for the newly formed Second Australian Patrol Boat Squadron. From mid-1971 the first Patrol Boats commenced refitting in Cairns with the work being carried out by private contractors. On 1 February 1974, the Grafton Street Establishment was then given the title HMAS Cairns and commissioned under the command of CMDR JM Yates RAN. By then the complement had grown to four officers and 30 sailors. Left: HMAS Barbette. Right: HMAS Barricade. Left: HMAS Bayonet. Right: HMAS Flinders. At this time HMAS Cairns also became the home port for the three Attack Class Patrol Boats HMA Ships Barbette, Barricade and Bayonet as well as a single Hydrographic Survey Ship HMAS Flinders. HMAS Cairns now sits on the site of a former Navy ship repair facility originally built by Navy at the outbreak of World War II. Reconstruction of the new establishment began in 1979 and the base was relocated and formally recommissioned here at Draper Street on 28 May 1982 under the command of CMDR AH Brecht RAN, along with an expanded complement of 13 officers and 100 sailors. The base expanded until a major redevelopment was undertaken in 2008-2009 which transformed it into the modern complex that exists today. The Cairns region has a tropical climate, with generally hot and humid summers and milder, drier winters. The region is characterised by two seasons - the green summer season (or 'the wet'), which begins around November and ends around May, and the dry winter season. Being a monsoonal climate, most rainfall occurs between January and March. The cyclone season is normally confined to between December and April. The Cairns region has fairly uniform temperatures throughout the year. Typical daytime temperatures range from 14 to 26ºC in mid-winter/dry season, and 24 to 33ºC in mid-summer/wet season. For current weather observations and reports for the Cairns area, visit the Bureau of Meteorology website (external link). The dangerous marine stinger season typically runs from November to May (subject to seasonal variability). Check with your local council for more information. You will be the envy of your shipmates when working and living in Cairns, as the city of Cairns boasts an international airport, casino and the Great Barrier Reef in your backyard. Snorkeling, scuba diving, bungee jumping, whitewater rafting and skydiving are amongst other popular activities for the adventurous. Defence is dedicated to recognising the very important and valuable role of ADF members and their families in the achievement of the Defence mission. While carrying out their daily tasks, whether here in Australia or deployed overseas on operations, our personnel need to be assured that their families are well cared for and have the support they need. For this reason Defence has tasked the Defence Community Organisation (external link) (DCO) to support commanders in looking after the welfare of Defence families. DCO does this by providing a wide range of services that all members and their families can access to help them cope with aspects of the Defence lifestyle. The DCO has produced a Cairns Welcome Book to assist Defence personnel and their families posting to the Cairns region. Service accommodation is located off base at the Northern Heritage, which is a hotel/resort style live-in complex situated on Sheridan Street, Cairns North (7 minutes from HMAS Cairns). All rooms are comfortable and self-contained. Entertainment facilities are provided including a bar, TV lounge, outdoor BBQ, swimming pool and spa. Service transport to and from work is available on weekdays (excludes weekends and public holidays). All service meals are provided. Service accommodation is also located off base at Las Palmas, which is also a hotel/resort style live-in complex situated on Sheridan Street, Cairns North (7 minutes from HMAS Cairns and one block away from the Northern Heritage). All cabins are comfortable, self-contained and are cleaned daily. Entertainment facilities are provided including TV lounge, outdoor bar and BBQ with pay TV and swimming pool. All service meals are provided at the Northern Heritage. Officers, Senior and Junior Sailors who are married, in a recognised inter-dependent relationship, or have children, are entitled to live in a Service Married Quarter (SMQ) provided by the Defence Housing Authority (DHA). If DHA is unable to provide a Service Married Quarter and you have to take private rental accommodation, then Rental Allowance (RA) may be offered. RA is an allowance paid to help off set the costs of living in private rental accommodation. Many single members also have the option of living in private rental accommodation. It is a mandatory requirement that all Navy personnel maintain a minimum level of personal fitness, and as such, are individually ready to deploy at short notice. Personnel are therefore encouraged to participate in sporting activities to maintain personal fitness. You may also be selected to represent Navy competing against local teams, visiting Foreign Services, Inter-Service (Army and Air Force) and Combined Service teams. From time to time ship's company will have the opportunity to undertake activities such as adventure training (team building) at locations such as Tully River, Barnard Island and Wooroonooran National Park. Personnel may be required to undertake guard training for ceremonial occasions eg. Navy Week, Anzac Day, Battle of the Coral Sea Commemoration, Remembrance Day and Victory in the Pacific (VP) Day. Unless required for duty, leave is in accordance with HMAS Cairns Base Standing Instructions. On certain occasions leave is granted by the Head of Department. Note: If you are under 18 years of age you are required to return to quarters before 11:59pm. To discuss potential opportunities in relation to Navy attending your school or next event please email the Navy Community Engagement Program - North Queensland at ncep.nq@defence.gov.au. For ADF ceremonial requests please submit the Australian Defence Force Ceremonial Support Request Form to Joint Operations Support Staff (JOSS) North Queensland (joss.nq@defence.gov.au or fax (07) 4411 7742), or visit the Defence Ceremonial Requests website for more information.